This is the Team RLR (Rahal Letterman Racing) #90 BMW M3 GT2. This may look familiar, as I’ve talked about it’s newer, slower, sister car, the Team RLL BMW M3 GT before. Yes, I did say the newer car was slower. Specs are similar, same 4.0L V8, aluminum block & heads, etc. But this GT2 version was tweaked for more, well, everything then it’s GT classed sibling. More power – 485hp, up from 470hp. A hair more torque 368lb-ft from 365lb-ft. And this GT2 version was lighter – 2745 lbs vs the GT’s 2830 lbs. Why the change? ALMS moved away from having two GT classes (GT2 and GT1). 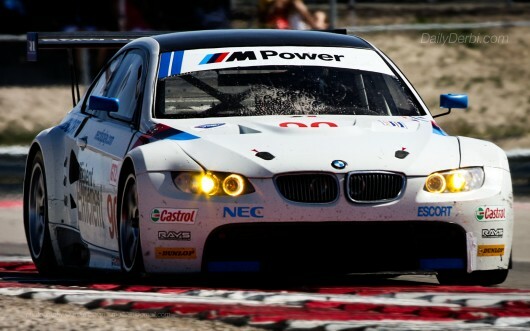 Team RLR / BMW decided to stay in ALMS series and slowed their car to meet the new GT specs. Racing and business politics aside, was this the finest an E92 BMW M3 could be? Or are you happy with the current GT classed M3? Chad Waite on December 19, 2011 at 4:03 pm.